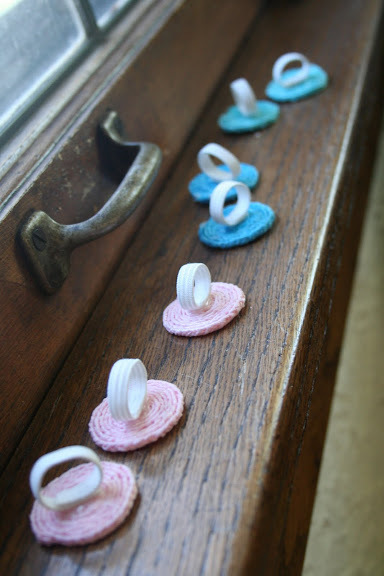 I found this tutorial for ribbon rings awhile back and finally perfected my own version for Mother's Day gifts (after a couple fails with hot glue, etc). For these I used a 1/8" width ribbon (which is smaller than the tutorial and led to me changing things up a bit so I stopped burning my fingers with hot glue!) and cut 3 lengths of ribbon about 20-24" long. I hand-sewed the three ribbons together at one end with a coordinating embroidery thread and safety pinned it to the couch (or my pant leg depending on where I was working). Then I braided the ribbons semi-tightly and hand-sewed the other end closed. After that I rolled the ribbon up in a coil (to get it to bend the way I wanted it to), then unrolled it and coiled it again, this time gluing it as I went with craft glue. 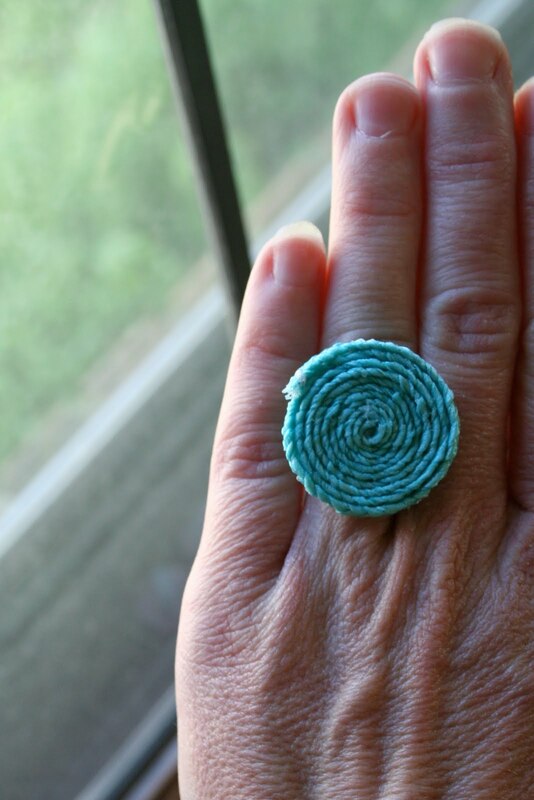 I let the glue dry overnight before adding the "ring." The ring was just a loop of thin elastic I cut to fit my own finger. I hand-sewed the elastic into a loop and then used craft glue to attach it to the ribbon coil. The elastic soaked up a lot of glue so I used quite a bit of glue for this step. Again, I let dry overnight. And here is the finished ring (and I beg you not to judge the aging & dry hands or the fingernails...I take care of my toenails & that's about it! )...big & funky, but I think fun too? These are my favorite colors right now...dreaming of summer perhaps? Love!!! I wore mine on Mother's Day, and it coordinated perfectly with the outfit I wore! How did you know?? You're the best! !